By Mike Sinkula, 2013 Shh… don’t tell anyone. But, it seems that the whole world of website content design has changed. No longer can you get away with having a website that doesn’t take into account displaying the content correctly on the whole series of mobile devices. So, what do you do? Do you start over from the ground up, or can that old website be converted to display the content correctly at all of the newer and smaller resolutions? If you are anything like me as a web designer, you have really come to love the 960 Grid System over that past few years. And, you have most likely spent many an hour perfecting your website’s content to pixel perfectly align to it’s most amazing and simple 12 column grid. However, before you begin this endeavor, I recommend reading Responsive Web Design by Ethan Marcotte. It’s something that you can read in a night and it will cover all of the basics you need to know. I read this before I turned my blog into a responsive design. The first thing that you will need to know is that you will need to have your website inform the devices how to display your content correctly. This will allow your website to work on all of the popular mobile devices. If you come from a traditional print background, you are used to always having pixel perfect control over a fixed width world. My advice to you… get over it. I did. You are now going to have to get used to using percentages and ems in your typographic design. This will set all typographic elements on your page to a default 16px font size and a 24px line height. From there we can start to convert everything else to ems. You will also need to get used to the idea that your images and media will need to scale according to their parent elements as well. This will allow the images and media to scale down uniformly as their parent elements scale down around them. This will also overwrite any width settings declared in the image tag. When it comes to making the rest of the layout, you can still leave your measurements mostly alone at screen widths above 1024px wide instead of converting everything to percentages right away. If this sounds funny to you, my reasoning is that I have experienced some issues with elements not lining up correctly when I create percentages for widths above 1024px. The one change you will need to make, though, is to your parent layout elements. In this case I have reset my #header from a fixed width of 1000px to a “max-width” of 1000px. But, notice that I have left the child elements of #logo and #tchotchkes at their original fixed widths. You can use this same methodology for all other parent layout elements that contain child elements. With all of these elements set in motion to scale responsively now, you should see your site start to scale down at smaller resolutions! However, you will also need to make some adjustments to your design at some of the smaller resolutions. For instance, as my site scales down, there comes a point in time where having the #logo and #tchotchkes elements and the #content and #sidebar elements floated next to each other either doesn’t fit anymore or just becomes too unbearable to look at. Therefore, I have chosen to hide the #tchotchkes element and reset the size and placement of the #logo element. 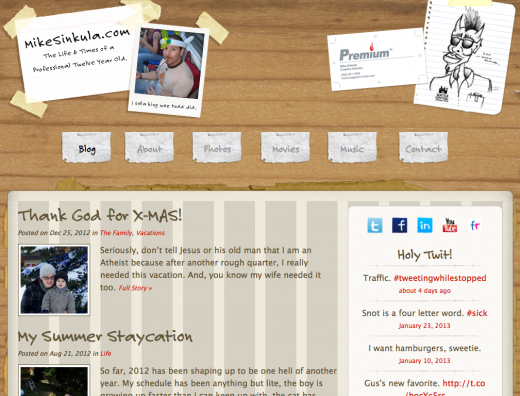 I will also need to set the #sidebar element to clear underneath the #content element. For this design, I have chosen the break-point of 600px wide to do such a thing. Now, to deal with the navigation scheme. In short, there are many different ways in which a designer can choose to deal with how the navigation scheme behaves at the smaller resolutions. Because my blog gets separated into two distinct navigation schema of “pages” and “categories” I have chosen to go with the “select menu” approach. 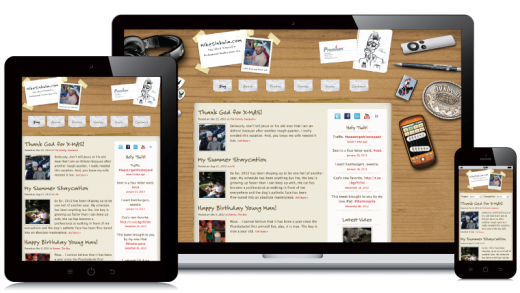 And, as Bob is your Uncle, I now have a responsively designed website for mobile devices! I am so glad that Mike modified his website for mobile devices. Now, I can see all of the new cute pictures of Gus from my phone! I hope this tutorial helps you to convert your 960 grid website to a responsive design that works on all of the mobile devices.